Mayor Bill White, Council Members Edward Gonzalez, Melissa Noriega and James Rodriguez, and members of the Mayor’s Hispanic Advisory Board will recognize various Hispanic community leaders for their contributions during Hispanic Heritage Month. A reception to honor the award recipients will take place Wednesday, September 16, at the Wortham Center, Grand Foyer, 501 Texas Avenue, from 5:00 – 7:00 p.m. 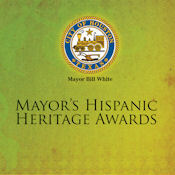 Recipients also will be presented consecutively with a mayoral proclamation in their honor at Tuesday City Council sessions throughout Hispanic Heritage Month (Sept 15-Oct 15). This year’s sponsors include AT&T, Bank of America, Comcast, HEB, Southwest Airlines, City of Houston Convention and Entertainment Facilities Department, Mayor’s Office of Special Events, Univision 45/Telefutura 67, Mi Pueblito Restaurant and Eastman Photography.